You are here: Home / Rants / Should I Quit My Art Gallery? Should I Quit My Art Gallery? Glass artist Danni McCarville emailed me with a situation that I’m starting to hear more and more – a store that sells some of her smaller pieces of work sent her a letter saying that they would no longer allow her to display her website or her full name on the work that she was selling in the store. They were doing this because, they claimed, collectors were bypassing the store and going directly to the artist. I would even go so far as to say that no website is unacceptable as well. Any gallery or store relationship with an artist should be a situation where everyone feels like they are winning. A store or gallery’s reputation should be enhanced by carrying certain artists’ work, and artists in turn should have their own reputation spread by the store’s distribution. The Internet is changing the dynamics of the art world. Here are a few things to keep in mind when dealing with your art gallery. Get a Contract – The Art Business is a Business. Make sure that you have everything that you are doing with the gallery spelled out. Which pieces are you selling with them? How long will the contract last? What is the commission split? Is the price variable? Does the gallery get a piece of your website action? How long do they have to pay you? 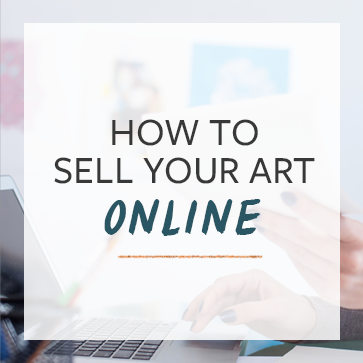 Promote Your Gallery – Every artist’s contract with their gallery is different, but generally it’s a good idea to list your gallery on your site. They’re working to support you – show them some love. Send interested parties to the gallery to negotiate sales. Don’t Cheat Your Gallery – Keep prices on your website the same as they are in the gallery. Undercutting a distributor is not cool. Another alternative is to split everything with the gallery – including sales on your own, or through your own website, or sales through a portion of your website. But, Should I Quit My Gallery? More and more artists are doing it for themselves, right? I have interviewed a large host of artists who are making a living selling their art without gallery representation. Perhaps another time I could make a list of all of them. I know artists who are making $100,000 per year or more without gallery representation. So, should you quit your gallery? Here’s the thing: doing it yourself is a challenge. You can’t just hang out a shingle on the Internet and expect people to show up and give you their money. You have to market yourself every day. You have to be willing to learn the stuff that they don’t teach you in art school. I don’t think it’s a coincidence that most of the artists I know who are doing it on their own didn’t go to art school. If you think that you can do better on your own, and you are willing to sacrifice, scrimp, save, and put yourself in uncomfortable situations then yes, absolutely quit your gallery and go your own way. But, if you need someone to talk to people for you, if you need someone else to handle the money end of your career, if you would prefer to not think about it, then stick with your gallery. You should also know this: No matter what the gallery says, they have their own best interests at heart, and those interests are not necessarily yours. You can have a great partner in a gallery owner – but your career is ultimately yours. You must decide. What do you think? Should artists quit their art galleries? Hmmm, great post. After some thought I have decided to sell directly through my website. It has worked out better for me, as galleries in NZ take approximately 40% – 45% of the sale price as a commission, and I am actually selling more now through my own efforts. I still take part in short term group exhibitions now and again, as this helps my work gain exposure to a wider audience…and it also helps build credibility within the local art world, I guess…but I think art is no different to many other areas… the internet is cutting out the middle man. I’m represented by Historic Car Art gallery in the UK, and we have a really good, up-front relationship. I promote the gallery on my blog, and they actively promote their artist. If I’m ever interviewed for a magazine or newspaper feature, I always make sure to mention them. They started a blog after I pointed out the benefits of having one, and like me, are also using Facebook and Twitter in their marketing.Together, we’ve worked to promote each other, and it’s been an excellent, respectful, fruitful relationship. In the case mentioned, I would recommend taking a sales posture. (You selling yourself to the gallery .) The gallery has an objection that needs to be addressed. In truth, they don’t care if your full name is listed, or even your website is featured. They just don’t want to lose sales! But hold your ground. The demand to remove your full name and website from view is bad business for everyone. @Automobiliart That’s fantastic! How have the sales been flowing? I would be interested in speaking to them about how they are evolving the way that they do business on the web. I don’t think the decision needs to be exclusive. I spend a lot of time promoting my art (and my “brand”) on line. A large percentage of my sales are generated from these efforts. But I also have my art in galleries. I think having a combination of both is a great opton for artists. Ufortunately there are many artists out there who think success is measured by whether or not their art is in a gallery. The problem with that philosophy is that you really need both. Galleries are struggling and they work incredibly hard to sell the art featured in their galleries. But artists can’t wait for a gallery … they need to spend a considerable amount of time marketing their own art. Often it is this success that will open a door to a gallery. So pursue both and don’t waste time waiting for a gallery to knock on your door. And once you are in a gallery, be thankful and do everything you can to help the gallery sell your art! I have sold over 75 pieces of wall art so far this year. No gallery has ever approach that number of sales for me. It is true, you have to do a lot of work self promoting. I do that through blogging, social media and face to face networking. many artist spend as much time seeking representation by a gallery as I do representing myself. Doing it myself, I have more control over the situation and the payoff is better. For those already in galleries, I would suggest that you make sure that your relationship is working for you and not taking advantage of you. If it is working, stick with it. If it isn’t, reconsider. I built an online gallery for a local artist a few years ago but it didn’t do very well. He finally closed the website and only sells from his brick and motor gallery now. A few years ago, thinking of quitting your gallery was akin to career suicide. My how things have changed. I believe artists today can and should control as much direct distribution of their work as possible. You just can’t count on anyone else to carry your water for you, and the means to get it done direct are there as never before. @LoriMcNeeArtist, of FineArtTips.com, and I explored this same question in a series of blog posts. The first was titled, “Visual Artist’s Challenge: Should I Work with Galleries, Go Direct to Collectors or Both?” It can be read on my Art Print Issues blog at: http://www.artprintissues.com/2010/05/visual-artists-challenge-should-i-work-with-galleries-go-direct-to-collectors-or-both.html. seems to me anything sold through my studio to anyone who originally found me in a gallery must generate a commission paid to that gallery. This requires I ask how the buyer found me, of course, but that’s not so difficult . . . And, yes, pricing must be the same, gallery to studio, and even among various galleries/venues. Basically, as in all things, the system needs to run on trust as well as a contract. A gallery not giving an artist’s name, or an artist underselling from a studio are matters of plain unfairness and not even vaguely worthwhile as far as I’m concerned. I don’t think so, We must appreciate the work and efforts taken by artist.